Menulog delivers for Masala Bowl so you'll be able to track your courier on a map. Prepared with papri, boiled potatoes, chickpeas and tamarind chutney with yoghurt. Chopped onion mixed with pea flour and spices and deep fried. Boneless thigh pieces marinated overnight in ginger and garlic and roasted in clay oven. 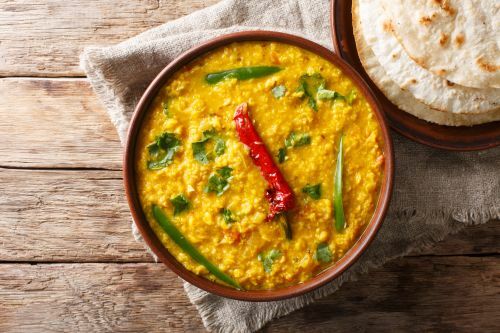 Yellow lentils cooked on slow heat, seasoned with sauteed onion, ginger, garlic and tomatoes and garnished with fresh coriander. Chickpeas cooked with blend of selected spices of North Indian style and garnished with fresh coriander and ginger. Tender pieces of chicken cubes roasted in clay oven and cooked in tomato, butter sauce with herbs and spices. Basmati rice and lamb cooked with spices. Fermented crepe made from rice batter and black lentils staple dish originated from South India. Served with sambar lentil dipping stew, coconut chutney and tomato chutney. Fried puff pastry balls filled with spiced mashed potatoes, spiced water and tamarind sauce. Type of chaat made out of puffed rice, vegetables and tangy tamarind sauce. Assorted vegetables dipped in pea flour batter, spiced and fried. Cheese in chutneys dipped in pea flour batter and fried. Homemade cottage cheese cubes marinated with yoghurt and roasted in clay oven along with capsicum, tomatoes and onion. 2 pieces. Triangular pastry prepared with crusty dough and stuffed with seasoned potatoes and peas. Served with mint and tamarind chutney. 2 pieces. Triangular pastry prepared with crusty dough and stuffed with lamb mince and peas. Served with mint and tamarind chutney. Tender spring chicken marinated in yoghurt and spices and gently roasted in clay oven. Spicy chicken dish originating from South India using curry leaves and mustard seeds. Lamb mince cooked on skewers with special spices to tingle your taste buds. Tender rack of baby lamb marinated in yoghurt, spices and herbs and gently roasted in clay oven. Fish cubes marinated in lemon and herbs and deep fried. Big juicy prawns marinated overnight in yoghurt, herbs and spices and roasted in clay oven. Fish cubes marinated overnight and gently roasted in clay oven. Black lentils and red kidney beans stewed seasoned with butter, spices and a dash of fresh cream. Baby potatoes tempered with cumin, turmeric and herbs. Fresh seasonal vegetables cooked in ginger, garlic and a mixed of spices. Cottage cheese, diced onion and capsicum seasoned with spices, cooked in onion gravy and finished with a dash of cream and fresh coriander. Cottage cheese and mashed potato balls deep fried until golden brown and cooked in rich creamy sauce. Potato and peas cooked in onion gravy. Fresh spinach delicately blended and sauteed with homemade cottage cheese cubes. Fresh mushrooms sauteed with delicately blended fresh spinach and garnished with fresh coriander. Seasonal vegetables cooked in an exotic sauce, creamy, mildly spiced and extremely flavourful. Okra stir fried with onions, tangy spices and herbs. Paneer tikka cooked in thick tomato gravy with plenty of oomph in it. Cauliflower and potatoes sauteed with onion, ginger, garlic and green chilli. Marinated chicken chunks tikka gently roasted in clay oven and cooked in thick spicy gravy. Tender chicken cubes cooked in selected spices and homemade cottage cheese gravy. Tender lamb cubes cooked in selected spices and homemade cottage cheese gravy. Tender chicken cubes cooked with tomatoes, onion and mixed with vegetable tangy flavour. Tender lamb cubes cooked with tomatoes, onion and mixed with vegetable tangy flavour. Boneless spring chicken sauteed with thick cut pieces of onion and capsicum and cooked in onion gravy and spices with a dash of cream. Lamb sauteed with thick cut pieces of onion and capsicum and cooked in onion gravy and spices with a dash of cream. Meat simmered in gravy of pureed spinach. A delicacy of Punjab. Chicken cooked in delicious mango pulp, creamy and lightly spiced sauce. Tender chicken cubes cooked in coconut, mustard seeds and herbs from South India. Tender lamb cubes cooked in coconut, mustard seeds and herbs from South India. Originated from Tamilnadu South India. Cooked with cream, coconut and black pepper. Tender chicken chunks cooked with assorted spices and fresh methi (fenugreek) leaves. Pieces of meat cooked in authentic vindaloo gravy Goan style. Pulled lamb sauteed with diced onions, capsicums, ginger and fresh coriander. Pulled spring chicken sauteed with diced onions, capsicums, ginger and fresh coriander. Pulled goat sauteed with diced onions, capsicums, ginger and fresh coriander. A very basic dish with full of flavours. Fish cooked in authentic and traditional South Indian style. Fish fillets cooked in tomato, coconut and creamy sauces. Prawns cooked in butter, tomato and creamy sauce with herbs. Prawns cooked in hot and spicy herbs. Chicken pieces simmered in spices and mixed with basmati rice. Basmati rice tempered with cumin, peas and turmeric. Basmati rice cooked together with vegetables, aromatic herbs and spices. Fermented crepe made from rice batter and black lentils stuffed with cooked potatoes, onions, green chillies and spices. Served with sambar lentil dipping stew, coconut chutney and tomato chutney. Fermented crepe made from rice batter and black lentils stuffed with chicken and spices. Served with sambar lentil dipping stew, coconut chutney and tomato chutney. Fermented crepe made from rice batter and black lentils stuffed with lamb and special species. Served with sambar lentil dipping stew, coconut chutney and tomato chutney. Fermented crepe made from rice batter and black lentils stuffed with cottage cheese and spices. Served with sambar lentil dipping stew, coconut chutney and tomato chutney. With spicy dosa and red chutney as base stuffed with potatoes and onion mixture. Served with sambar lentil dipping stew, coconut chutney and tomato chutney. 2 pieces. Cottage cheese and corn flour dumplings fried and soaked in hot flavored syrup. Served with rabadi. Grated carrots pudding with khoya similar to ricotta cheese. Rice pudding flavoured with green cardamom. Combination of chickpea curry and fried bread called bhatura.